Gene Nalbandian’s first book, “Lamentations of a Dad: How Takeaways Led to Comebacks” allows the reader to enjoy an intimate conversation with Gene; who openly and honesty shares the lessons he has learned from the roller coaster of his life. Laguna Beach, CA (USA), 6th June, 2016 — Gene Nalbandian has lived almost eight decades and his personal journey includes being a descendant of Armenian Genocide survivors, founding a number of entrepreneurial businesses, a stint as a pro-ball player for the Chicago Cubs, as well as being the first man in California to legally obtain full custody of his three children. His first book, “Lamentations of a Dad: How Takeaways Led to Comebacks” allows the reader to enjoy an intimate conversation with Gene; who openly and honesty shares the lessons he has learned from the roller coaster of his life. “Lamentations of a Dad: How Takeaways Led to Comebacks” offers hope to those who have struggled with loss, failure and disappointment. Gene shares the lessons he has learned and the comebacks he has enjoyed by simply mastering the art of picking himself back up and moving forward, one step at a time. The loss of his youngest son, Derek, just two short years ago, has certainly been the biggest struggle and most painful experience. To learn more about “Lamentations of a Dad: How Takeaways Led to Comebacks” or topurchase your copy, visit Halo Publishing, Amazon and/or Barnes and Noble. Gene Nalbandian is currently living in Laguna Beach, California with his soul mate. He is involved by using his entrepreneurial background to mentoring graduate MBA students at his beloved UCLA. He is Co-founder of the Fresnotizis, a group of prestigious American Armenians who have accomplished careers as judges, lawyers, publishers, businessmen and retired professional athletes. He is an accomplished traveler having visited countries throughout the world with his beautiful wife and has developed a perspective which he loves to share with his friends and colleagues. Gene spends much of his time with his children and grandchildren, always challenging them to be the best that they can be. He also pursues athletic endeavors by playing golf and participating on the Senior Tennis circuit. Lamentations of a Dad is a wonderfully heartwarming memoir that will lift your spirits and show you that even when tragedy strikes, there are always rainbows that emerge from the darkness and gloom. Gene was born into an ordinary family who was proud of their culture and beginnings. He graduated from college and was signed by the Chicago Cubs as a promising pitcher. This was a dream come through for Gene. But sadly, a tragic injury ended his career with the Cubs and he had to search another path in his life. But this set back let to another comeback later on. Gene’s life was also speckled with several other setbacks. He married, divorced, became an entrepreneur, became a single dad, and experienced the death of his son to a drug overdose. But even in the middle of all of these tragic experiences, there were always the comebacks and the rainbows that appear from the darkness. Gene is a true testament of strength and courage. He shows that we can all learn to cope and not get discouraged, even when there are many really awful things that happen to us in our lives. His walk and trust in the Lord has always given him the strength to endure. All the negative and positive events of his life have made him who he is today, a strong, courageous, grateful, and peaceful man. I recommend this book to anyone who has experienced a lot of hardship and tragedy and feels trapped by all these events. Gene’s book will enlighten you and give you the strength to courageously carry on. Palo Alto, CA, April 02, 2015 — /REAL TIME PRESS RELEASE/ — Stanford student Jerming Gu, founder of CANDY HOUSE Inc., raised more than $800,000 dollars after his product launch on Kickstarter. 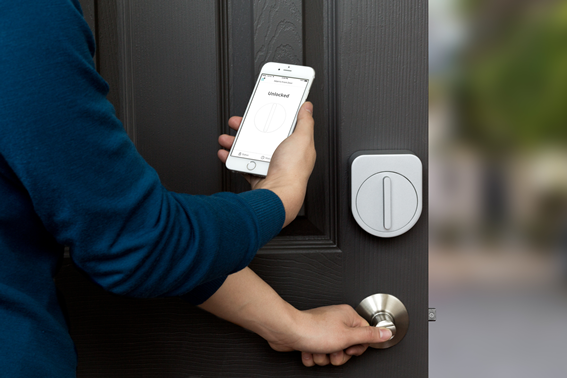 Sesame – the world’s first instant smart lock – reached its funding goal in nine hours when first introduced. Currently, nearly 5,000 supporters have backed the project. Palo Alto, CA, March 27, 2015 — /EPR NETWORK/ — Sesame, the world’s first instant smart lock, raised more than seven times of its funding goal on Kickstarter. Launched on Kickstarter on Feb. 25, 2015, Sesame has raised more than $760,000 from backers all over the world. Elkridge, MD, June 19, 2013 – Mabey Inc., a leader in bridging, shoring, temporary roadways, and construction rentals, is proud to announce that its CEO, Robert Aylward, has been named a finalist for the Ernst & Young Entrepreneur Of The Year Award in Maryland. This award, given in 25 regions of the U.S., as well as in many locations abroad, honors leaders who are driving successful, innovative companies. The Maryland winner will be selected from among finalists who are judged by a panel of entrepreneurs and prominent leaders from business, academia, and the media. The Ernst & Young Entrepreneur Of The Year has been celebrating entrepreneurs for more than 25 years and is the world’s most prestigious business award for entrepreneurs. The awards will be presented on June 26, 2013 in Baltimore. Mabey Inc. has more than 20 years of experience in serving the transportation, construction, and utility industries. We specialize in providing PE-certified engineered solutions with the rental or sale of equipment for bridging, structural shoring, excavation shoring, and temporary roadways. For more information, please visit www.mabey.com. Host Deanne DeMarco interviews Kelly Standing, whose near-death experiences turned into a life-affirming adventure, and Dr. Patricia Arredondo, an inspiring multicultural counselor and women’s advocate. DeMarco’s show, “Today’s Inspiring Women,” airs noon Pacific on Thursday on the VoiceAmerica Empowerment Network. Hillside, IL, May 19, 2013 – One woman has turned a lifetime of near-death experiences into an amazingly positive outlook on life. Another has spent her life as a passionate multicultural counselor, social justice advocate and promoter of women’s leadership. Both women are guests next Thursday, May 23, during Deanne DeMarco’s weekly hour-long program on the VoiceAmerica Empowerment Radio network. The brushes with death? Hanged from a tree by a childhood bully. Hit by a car. Struck by lightning. Removal of a major organ (which contrary to medical precedent actually grew back). And on top of all that—four of her co-workers were brutally murdered. Learning how to live? Kelly has traveled the globe; ranked among the top nine public speakers in the world out of 25,000 contestants and 180,000 Toastmasters; served as student chaplain to criminal youth; worked as a hospital chaplain in a Level-One trauma center; and now runs her own company, STANDING Media, focusing on individuals and organizations who want to rally around change and adversity. Dr. Patricia Arredondo is President of The Chicago School of Professional Psychology (TCSPP), Chicago Campus. She joined the school in February after senior administrative roles with the University of Wisconsin-Milwaukee and Arizona State University. Formerly, she created and led a Boston-based organizational consulting company for 14 years. Author of more than 100 articles, book chapters and training videos, Patricia has an extensive scholarship record with a focus on multicultural counseling and women’s leadership. Her contributions in her field have been acknowledged with numerous accolades including the “Living Legend” award from the American Counseling Association (ACA) and Lifetime Achievement Award from the American Psychological Association (APA) Division 45. She is the 2013 recipient of the prestigious Henry Tomes Award for Distinguished Lifetime Contributions to the Advancement of Ethnic Minority Interests. Deanne DeMarco herself has used her innovative strategies—drawn from successful experiences as a scientist, college instructor, management trainer, Fortune 500 manager, author and entrepreneur—to help business executives and individuals break through personal and career roadblocks. Each week she interviews extraordinary and inspiring women who may not yet be household names but are business and entrepreneurial rising stars. Deanne DeMarco’s career has revolved around helping people break through boundaries and career roadblocks. She has a strong business background with expertise in medicine, education and utilities. As a medical scientist she was on the original three-member team that first discovered the cancer link to second-hand smoke. As a corporate trainer her management coaching program won national recognition from Training Magazine’s Top 100. Deanne conducts fun, interactive workshops and seminars and is a keynote speaker at business and association meetings around the world. For more information: www.deannedemarco.com or call 1-708-836-0118 or 1-866-91-COACH. Host Deanne DeMarco interviews special guests entrepreneur and author, Vonda White, and ground-breaking female firefighter, Karen Moulder, on Thursday’s episode of “Today’s Inspiring Women.” Noon Pacific on VoiceAmerica Empowerment Network. First up will be award-winning business entrepreneur and author, Vonda White, who will share her remarkable life story from her days as a food stamp child. The second guest is an equally as motivating role model for women—mother of five, Karen Moulder, who was the first female firefighter in Brownsville, Texas. Both women are slated to appear next Thursday, May 16, during Deanne DeMarco’s weekly hour-long program on the VoiceAmerica Empowerment Radio network. Vonda’s life today is a far cry from her childhood, raised by a divorced mom who had to accept welfare and food stamps. Young Vonda’s contribution to the family finances was collecting and redeeming empty soda cans. As a teenager—at her third attempt—she won the Idaho state beauty pageant. The triumph came with college tuition and the beginning of a new life which led her into a record-setting insurance sales career and the launch of her own business while six months pregnant. Karen Moulder entered a man’s world when few women did so. A lifetime of breaking personal and professional barriers was epitomized by her getting hired in 1983 as the first female member of the Brownsville, Texas Fire Department. She says that her tomboyish nature and single mother status led her to this fascinating and dangerous career which lasted 10 years. A serious car accident brought Karen’s life as a firefighter to an end but launched her in a new direction. She went back to college and majored in business. After college she managed a physician’s office and obtained her certification in medical billing. Subsequently, she moved to Massachusetts and started her own medical billing company. Karen wrote the book “Burning Barriers” to share her life story and encourage other women to pursue their dreams. Host Deanne DeMarco interviews special guests Master of Wine Jennifer Simonetti-Bryan and financial expert Stephanie Skaggs on Thursday’s episode of “Today’s Inspiring Women.” Noon Pacific on VoiceAmerica Empowerment Network. Deanne DeMarco’s guests next Thursday, May 9, for her weekly program on the VoiceAmerica Empowerment Radio network, are two inspiring women from the worlds of wine and finance. During the hour-long broadcast DeMarco, who has herself enjoyed twenty years of success as a career coach and entrepreneur, will interview Master of Wine Jennifer Simonetti-Bryan and financial expert Stephanie Skaggs. Jennifer Simonetti-Bryan is the fourth woman and among only 30 people in the U.S. to attain the distinguished title “Master of Wine,” the highest global achievement in the wine industry. She is the author of The One Minute Wine Master: Discover 10 Wines You’ll Like in 60 Seconds or Less as well a culinary textbook. She is also the author and host of five “Everyday Guide” DVD series on wine and spirits. Jennifer frequently appears on national television including NBC’s Today Show, Fox News, Fox Business Channel and Anderson Cooper. Deanne DeMarco will be exploring Jennifer’s path to success in this male-dominated field, discovering how she managed to switch careers, walk away from a 6 figure salary and what lessons can be learned for other women. She will also want to know if it’s true that women have a more sensitive sense of taste and smell. Stephanie Skaggs is an entrepreneur, business owner, financing specialist, mortgage professional and real estate investor. Over the past 16 years she has started 11 companies either by herself or with partners. As president of Asset Financing Group, Inc. she specializes in small business financing and commercial mortgages. She has helped more than 150 business owners and entrepreneurs obtain financing. Her expertise includes all things financial—both personal and commercial. Deanne DeMarco will particularly want to know if there are financing opportunities and strategies tailored for women entrepreneurs. She will be asking Stephanie for her insights into starting and bankrolling a business; what you need to know to avoid the pitfalls and become your own success story. Deanne DeMarco herself has used her innovative strategies—drawn from successful experiences as a scientist, college instructor, management trainer, Fortune 500 manager, author and entrepreneur—to help business executives and individuals break through personal and career roadblocks. Deanne DeMarco’s career has revolved around helping people break through boundaries and career roadblocks. She is a career coach and has a strong business background with expertise in medicine, education and utilities. As a medical scientist she was on the original three-member team that first discovered the cancer link to second-hand smoke (published in the Lancet). As a corporate trainer her management coaching program won national recognition from Training Magazines Top 100. For more than 20 years she has helped managers and individuals advance their careers. Today, she continues her work as an executive and individual coach. She conducts fun, interactive workshops and seminars and is a keynote speaker at business and association meetings around the world. For more information please visit: www.deannedemarco.com or call 1-708-836-0118 or 1-866-91-COACH. Many people find it hard to reconcile science and spirituality, even though both are big parts of the human experience. Entrepreneur Justin Ligeri has launched a new blog which he hopes will help people more easily integrate both spirit and science into their lives. Tampa, FL, February 17, 2013 (Straight Line PR) — Anyone who saw the movie “The Matrix” can understand and appreciate how revolutionary the idea of quantum theory can be. Most people who have an appreciation for science can have trouble reconciling age old spiritual principles with scientific dogma. They often find the the two approaches to be mutually exclusive. The new web site and blog, http://www.JustinLigeri.net/ , is intended to help close the perceived gap between spirituality and science. “Over the last twenty years I have attended hundreds of seminars and lectures as well as read hundreds of books that have attempted to bring together the latest cutting edge research of science with spirituality. My purpose is to be a content curator where I comment on what I find and share it with subscribers and people of like mind hoping that they too will enjoy it,” explains Ligeri. An avid reader, researcher and traveler, Ligeri hopes that by curating content that inspires and challenges the status quo, better things will be produced from the experience.